Would you like to start your garden or lawn from seed? We carry a wide variety of seeds from Botanical Interests, Harts Seed Company, and Livingston Seed Company, which offer the satisfaction of growing your own flowers, vegetables, or herbs. 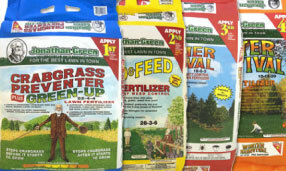 In addition, we carry a large selection of Jonathan Green grass seed for all application seasons and sun exposures. We also offer premium lawn care products from Jonathan Green and Scott’s Espoma including crabgrass preventers, seed accelerators, and fertilizers to promote hearty and healthy lawns. 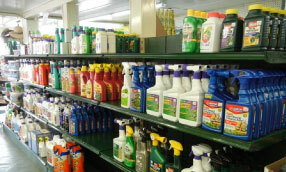 Let us help you maintain your garden with a broad selection of garden fungicides, insecticides, and herbicides, both organic and chemical. Our pest removal products eliminate critters of all kinds from insects to deer, and everything in between. Save your plants with tried and true results from our most popular product lines: Bayer, Bonide, Garden Safe, Ortho, and Safer. As organics have moved to the forefront of our culture, we have added a long list of organic lawn and garden products to our shelves. Among other suppliers, Jonathan Green Organics, Garden Safe Insect Controls, Espoma, and Neptune’s Harvest populate our store with the newest products designed to maintain and protect the environment. When it comes to the dirty work, we want to be sure that you are adequately prepared for the task at hand. Our garden tools and supplies selection offers the most durable products on the market. Look no further for garden gloves, shovels, rakes, and hose to facilitate easy and enjoyable gardening experiences.